Order in the next 3 hours, 57 minutes and 15 seconds for same day shipping. Ideal to number your documents - up to 8 bands. 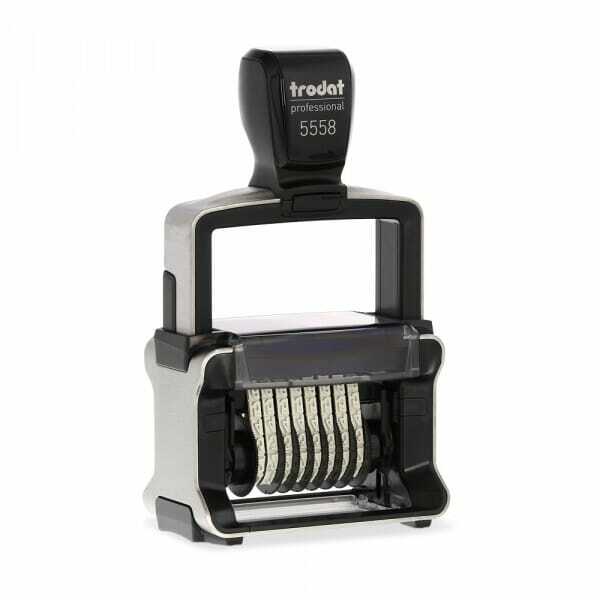 Trodat Professional 5558 has 8 bands with a character height of 5 mm. The imprint size is 3/16 x 1 5/8" (5 x 41 mm). Each band contains digits from 0 to 9 as well as additional characters e.g. €, N°, # or $ on the first band. Trodat's self-inking numberer features a new brushed stainless steel finish giving it a professional look while ensuring durability for heavy use. 5558 is a self-inking stamp with a built-in ink pad to last for many thousands of sharp and clear impressions. To further extend the life of your stamp, order the suitable replacement ink pad 6/56. Pads are available in black, blue, green, red and violet. Customer evaluation for "Trodat Professional Numberer 5558 8 bands"